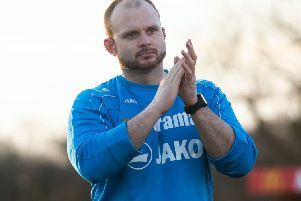 Hemel Town manager Dean Brennan was pleased with his side’s points return over the festive period, but has warned his players that they must improve defensively if they are to meet their targets. The Tudors won 2-0 at Oxford City, before drawing 2-2 at home to Wealdstone on Boxing Day and winning 3-2 at Maidenhead United last Monday – giving them seven points from a possible nine. They were looking to continue that good form in the reverse fixture at Wealdstone on Saturday, but the game was postponed due to a waterlogged pitch. Despite this, Brennan knows that his side must tighten up at the back if they are going to make a push for the playoffs over the second half of the season. “We’re happy with the performances but we aren’t happy with the goals we’ve conceded,” he said. “That’s something we’ve really got to rectify if we are going to progress this season. “We’ve scored a lot of goals this season and our front two are one of the best partnerships in the division, so it takes a lot to stop them. Looking at the positives, Brennan continued: “The biggest thing for me is our competitiveness – even in the games we have lost this season, we have always been competitive. That’s a real positive.